Buch vom 30. Oktober 2013. Jens’ erstes nicht-technisches und zugleich englisches Buch. Weshalb er’s mit dem Deutschen hier gleich ganz lässt. This is the book that the most boring person would write when it found a life and had too much time at his hands. Meet Jens, a hectic, neurotic self-proclaimed adventurer, and his very individual account of one hundred different activities he’s tried over the last three years (2010–2013). From crocheting to security guard certifications to rafting, everything had a lesson, and these lessons are shared in this book. Expect the German answer to Winston Wolfe to explain how to live a life, in his own words. Jens O. Meiert believes that people have many talents. Jens is an established expert web developer who has contributed to technical standards of the Web (W3C) and who has laid the foundations for large-scale international websites that reach tens of millions of users every day (GMX, Google). He has written a book about designing with CSS (O’Reilly, 2005/2007), developed frameworks and quality management systems for Google (2008–2013), and got nominated “Web Developer of the Year” by .net magazine (2011). 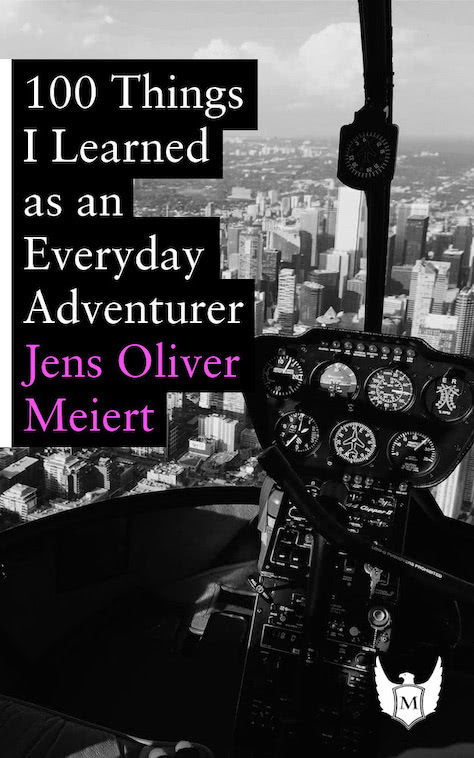 Jens is an everyday adventurer, described in this very book, who has traveled 6 continents, 40 countries, and more than 200 cities. He has made it his priority to try whatever is new to him, whatever activity or sport or class (or even food) comes near him, and documented almost 200 of these in the last 3 years alone. Jens just quit his job, left his city, to go backpack the world. Jens is a social philosopher who has over the last few years studied more than 100 works around the topics of philosophy, psychology, social sciences, religion, spirituality, public relations, marketing &c. He’s an active supporter of and contributor to initiatives for societies that place emphasis on freedom, trust, and rights, and he’s focusing his own efforts on breaking through the media-fueled apathy we observe in our world today. ❧ Am Buch wirkten außerdem Sarah M. Tyrrell (Lektorin), Julia W. Tang (Cover-Konzepterin und Gutachterin) sowie J. Felix Desroches (ebenfalls Gutachter) mit. Weitere Details und ein paar Geschichten zum Buch finden Sie in der englischsprachigen Ankündigung.